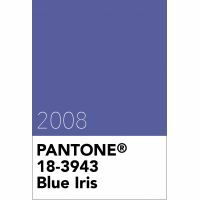 From a colour forecasting perspective, Pantone selected it's colour of the year for 2008, Pantone 18-3943 Blue Iris, as it best represented the predicted colour direction for fashion, cosmetics and home products. As a reflection of the times, Blue Iris brought together the dependable aspects of blue, underscored by a strong, soul-searching purple. Emotionally, Pantone 18-3943 was anchoring and meditative with a touch of magic. Combine Blue Iris with deeper plums, red-browns, yellow-greens, grapes and greys. Pantone 18-3943 Blue Iris is from thePantone Fashion, Home + Interiors colour library.